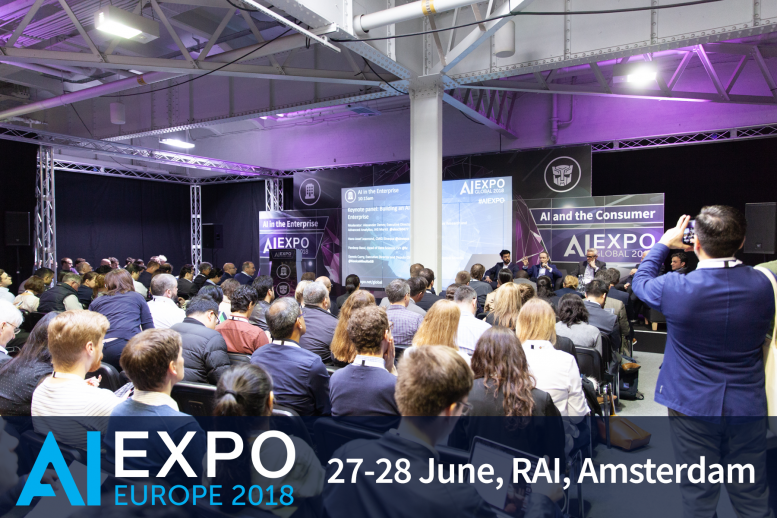 Arriving in Amsterdam on the 27-28 June, the second annual AI Expo Europe event will host 2 co-located events covering IoT and Blockchain, with 8,000 attendees expected to attend including CTO’s, CDO’s, Head’s of Innovation and Technology, IT Directors, Developers & Start-Up’s, OEM’s, Government, Automotive, Operators, Technology Providers, Investors, VCs and many more. The AI Expo will showcase the most cutting-edge technologies from more than 300 exhibitors and provide insight from over 300 speakers sharing their unparalleled industry knowledge and real-life experiences. The event will host a dedicated start-up incubator zone where you can see the latest AI & IoT technologies and innovations in action, in addition to the vast exhibition of 300+ companies who will be showcasing their products and services within the field of AI, IoT & Blockchain. 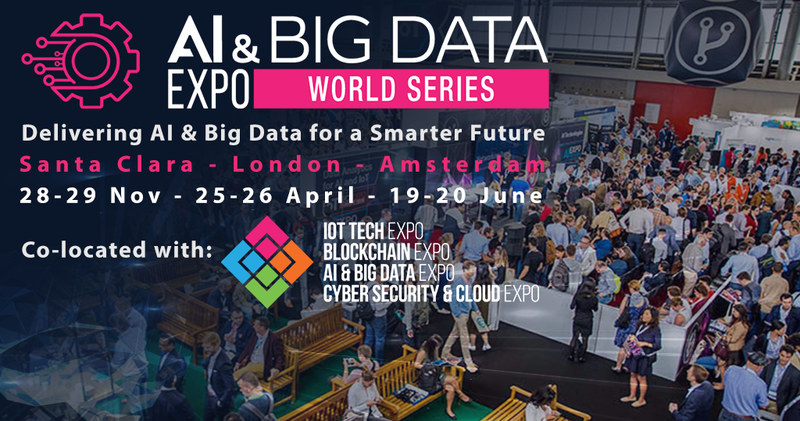 Expect to see demos and booths from Microsoft, IBM, PTC, Kore, Hercules, Thales, Rutronik, Enterprise Ethereum Alliance, BPU Holdings, Start-up Amsterdam, ML6, Bottos, Ortec Data Science, Adani, NTR Labs, Prosper BI and many more. Start-ups within the incubator zone include Aiir Innovations, Botsquad, Mercury.AI, IoTify, Porter, 3D Universium, Zazu, 904 Labs, Innovation in Motion, Blockhearts, Mind Trace, Sightcorp, Cupenya, Effect.Ai, Sodaq, Amberscript, BrainCreators, Clockworks to name a few. In addition, attendees can join speakers from Aiir Innovations, Mercury.AI and BrainCreators within the AI Technologies track on day 2 (28th June) as they explore innovative artificial intelligence techniques. Your Free Expo Pass will provide access to 10 conference tracks; AI Technologies, Data Analytics for AI & IoT, Developing for the IoT, Privacy & Security, IoT Innovations & Technologies, ICOs & Token Investments, Blockchain for Business, Developing Blockchain Applications, Blockchain Technologies and Blockchain Strategies. Register for your free expo pass here. Taking place on the 27th June at 10.15am within the Data Analytics for AI & IoT conference track, the Chief Data Scientist at Southern Water, a Data Scientist from Monsanto, a Data Scientist from Marel Poulty and the CEO from the predictive intelligence firm Prosper BI will be identifying target-rich, high-value data that can be used to generate business intelligence, looking at the use of cloud analytics platforms to derive value from AI & IoT data, and discussing the barriers to widespread AI/IoT/Big Data value delivery and how these might be overcome. Join Miriam Huijser, Co-Founder & Chief Research Officer at Aiir Innovations on 28 June within the AI Technologies conference track as she explores how intelligence assistants can be used to inspect aircraft engines using state-of-the-art computer vision techniques. Aiir Innovations is an Amsterdam based start-up that aims to bring artificial intelligence to the maintenance and aircraft industry. They will also be exhibiting within the start-up incubator zone within the expo floor. Co-located with the IoT Tech Expo and the Blockchain Expo, the AI Exhibition and Conference will allow you to explore 3 ecosystems in 1 and discover how the convergence of these 3 areas is powering the future of technology! Within the dedicated Data Analytics for AI & IoT track on the 27 June at 14.40pm, join AI & IoT thought leaders as they take to the stage for a panel discussion. Hear from Christophe Eschenbrenner, IoT & Data Foundations Program Manager from Alstom Digital Mobility, Violeta Misheva, Data Scientist at ABN AMRO Bank N.V., Filippo F.G. Della Casa, Head of Analytics at Unipol and Dor Kedem, Senior Data Scientist at ING as they discuss the increased need for big data analytics to drive AI & Machine Learning across a range of industries. Following the first day of the event, Speakers, Sponsors, Press, Ultimate, Gold and Expo Plus attendees are invited to attend an evening of networking. The Beach House will host the official networking party. It is located at the entrance of The Beach and surrounded by stunning beach scenery. Set away from the busier main structures and with its own bar and terrace. Discuss the topics from the conferences and build relationships with like-minded companies and individuals. All paid pass holders are also invited to attend the first ever Blocks awards ceremony at the Boat House from 18:00-20:00, find out more here. The final advance rate ends 15 June so if you are looking for full conference and networking access, you can save up to €150 on your conference and networking pass (Gold/Ultimate) when you book by then. Or click here to register for your Free Expo Pass to the Europe 2018 event on the 27 – 28 June in Amsterdam.